With thousands of satisfied clients, exceptional customer service, and cost-effective, customizable programs, Shred Wise is the best choice for ongoing, regularly scheduled mobile paper shredding services in Orange County. We have been serving commercial clients from nearly every industry since 2006, and understand how to meet their varied needs for secure document destruction. All of our shredding services use processes and procedures recommended by the National Association of Information Destruction (NAID), the premier trade association for those in the information destruction industry, and meet today’s strict guidelines for document destruction as set by local, state, and federal privacy laws. Our regularly scheduled onsite shredding services are available Monday through Friday on a weekly, biweekly, monthly, bimonthly or quarterly basis in most Orange County areas. 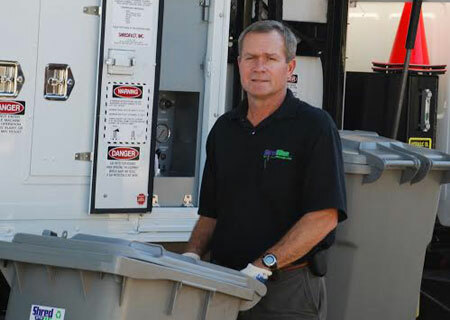 With every service visit, you can expect one of our carefully screened employees to arrive in the timeframe promised, empty your shred containers into secure rolling bins, and promptly shred your papers in our state-of-the-art mobile shred truck. Our clients are welcome to witness the destruction process, and will always receive a Certificate of Destruction once we are done. With Shred Wise, you can trust that 100% of your paper will be properly destroyed and recycled — we guarantee it. Unlike other mobile shred companies serving the area, Shred Wise is locally owned and centrally based in Orange County. Moreover, we keep the vast majority of our service routes within the Orange County region to reaffirm our commitment to serving our local business community. By staying local, we keep our costs low and pass those savings onto our customers. It also makes it easier for us to accommodate last-minute requests from our clients, whether they need additional shred bins or supplemental service visits for on-site or off-site shredding. To sign up for our ongoing, regularly scheduled shredding services in Orange County, you need only sign a simple service agreement. Our service agreements are essentially month to month and guarantee our prices for one year. While you use our ongoing mobile shredding services, you will be able to use our locking shred containers for free. We’ll supply you with as many rolling bins and/or consoles as you need, and help you determine where they should be placed. Because there are no hidden fees, no long-term contracts, and no auto-renewing contracts, it is no surprise that our clients only stay with us because they want to, not because they have to. Call today to learn more.